Day5 begins. To make up for Rob being late yesterday he decided to set the alarm, however technology V man, technology won. I was dragged out the shower early and answered my door dressed in a towel dripping wet (a little image for you all). I invited Rob in but he declined to watch me dress and we met for the usual egg omelette breakfast. Normal Put Put ride round to the bottom of Hussain Sager Lake. We forgot to mention in yesterdays blog we had our first Put Put on Put Put incident; despite our put being a clear 20cm in the lead and then breaking and swerving a fellow put put failed to manoeuvre out of the way and a collision ensued. Despite the lumps of extra metal over the wheel arches this resulted in a blow out in our put put and as we drifted to the side of the road we where descended upon by other put put drivers, not to help their fellow driver but like carrion birds to fight over two fat foreigners. We gave our driver a few Rupees and left him staring forlornly at his flattened tyre. Back to today, we boarded a very dodgy looking boat and took a ride across the river to see the Buddha statue. Although the scenery is spectacular and the setting wonderful, the lake itself is a strange green colour. Later we came across their attempts to fix this. Once on the island with the Buddha we where once more mobbed by people wanting to shake our hands and take selfies with us, even just wanting to be in our selfies. I did tell them that despite aperances I was not David Beckham, but to no avail. Of course by now its 11:30 and the sun s up, is 42 so what do we do. Yes go for a walk. We set off round the lake to see how the dam, or bund, was built and used and take a look at Indira Park. However failed to find our way down so carried on round through the heat, consuming bottles of water as we went. Eventually we found a small street food place called the Mar Ri-Ot, this was further improved by a large group of Americans leaving. Again we had a very good waiter who sorted out beer and humoured us by giving us a menu despite the buffet being ½ the price and having the same food. It is still interesting that despite us being in an international hotel we where the only westerners. After falling asleep in their garden for a while on we went round the lake, so local crossing the 6 lanes of traffic was a doddle. After working out how and where to pay the entrance fee(opposite side of the road at an unmarked booth of course !!! but not 10X for foreign devils this time) we went into the Sanjeevaiah Park. Much bird spotting and sitting under trees watching the world and his brother pass by. We continued round the edge of the park by the lake until we cam across a 'semi amphibious digger at work with the usual 3 managers shore side directing. Rob proceeded to get out the secret environmental water works handshake and much discussion about the works. They are building a motorised pontoon system to start cleaning up the lake. We carried on round and cam across another interesting contraption which was going to scoop out the rubbish that has been dumped in there for many years. Also on the bank watching was the owner of this brand new toy. He turned out to be the contractor the local government has appointed to clean up the lake and hopefully turn it into a major attraction. 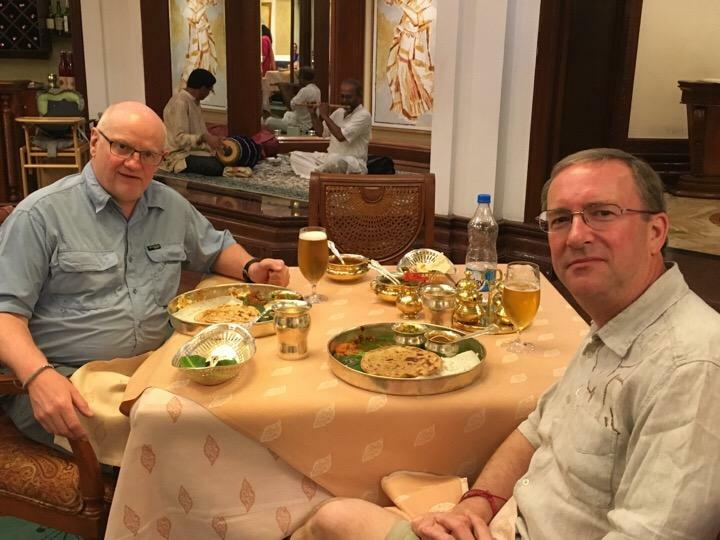 Again as with everywhere we have come across in India they where very friendly and we had long conversations about systems with Rob producing the international guild of water engineers handshake. Having consumed three and half litres of water we took a Put put back to hotel and a much needed shower and rest. Found this fantastic hotel restaurant just near us on trip advisor. We took a tuk tuk there and we directed him completely wrongly courtesy of some glitch on the 1 phone. Anyway we got there alright and after a 3km ride we ended up very close to where we started from. We paid the driver more than we should have for pi**ing him about. The hotel in very posh. The local cricket team the 'Hyderabad Sunriser' we're booking in. The restaurant had live Indian musicians playing and the staff were great. Lots of advice on what we might like to match our tastes etc. Including Rob 'not too spicy' Barker and David 'no tomatoes' Wastell. The food was excellent, and served in traditional metal tableware. Not too spicy and not too much tomatoes. We walked back across the 8 lane road in the dark. Luckily two policemen were doing the same crossing back to their car. So we used them as a human shield. No one was going to run them down.